Will Lumber Liquidators (NYSE: LL) Repeat the Chinese Drywall Scandal? Subject: Will Lumber Liquidators (NYSE: LL) Repeat the Chinese Drywall Scandal? Lumber Liquidators' (NYSE: LL) stock has been one of the hottest market topics for over a week now, thanks to a March 1 "60 Minutes" exposé on the company's products. Today the LL stock price closed up 10%, up from its previous 34% plunge. 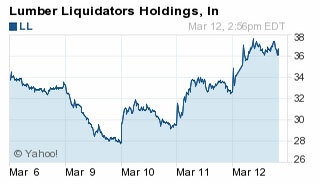 LL stock went from $51.81 to $38.70 after the "60 Minutes" report aired. LL stock rose 5% this morning in pre-market trading after news broke that hedge fund manager Robert Chapman of Chapman Capital took a long position in the stock. He expressed confidence in the company and its prospects. At one point today, LL shares were up more than 14% before closing at $36.08. CBS' segment claimed the Toano, Va.-based lumber company had been procuring its lumber from China, where there are no emissions standards tests. The result: the lumber sold by the company allegedly contained toxic levels of formaldehyde. At high levels, formaldehyde can cause cancer. At low levels, it can cause respiratory, nose, and throat issues. Things looked bleak for LL and its stock earlier in the week. Being accused of using dangerous materials from China does not always portend a company's demise. We learned this just a few years ago. Just after Hurricane Katrina and before the housing crisis, homes were constructed using drywall imported from China. But summer heat and humidity caused this drywall to emit sulfurous gasses carbon disulfide, carbonyl sulfide, and hydrogen sulfide. These gasses are carcinogenic. This time it was CBS News exposing the company at fault – German-based Knauf Plasterboard Tianjin Co. Ltd.
CBS ran six random drywall tests across the nation and compared the results to the affected samples. While both samples released sulfuric gasses, the drywall from China released much more.